You may think that there’s no way you could cook a different dinner every time. But you can! Its easy... join my journey to find out! I THOUGHT I'D TAKE MY JOURNEY TO HUB PAGES TO HELP OTHERS OUT THERE THAT ARE TIRED OF COOKING THE SAME MEALS ALL THE TIME. AND I WOULD LOVE TO GET MY HUB PAGE FOLLOWERS TO GIVE ME IDEAS - I LOVE TO HAVE YOUR INPUT!!! STAYED TUNE TO POSTINGS TO SEE WHAT PRODUCTS MAKE COOKING DINNER SO MUCH EASIER! 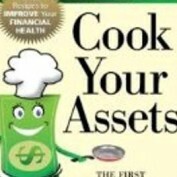 My profile pic is the cover of the cookbook I wrote caled Cook Your Assets. I am a cpa and a foodie so I combined both into a financial planning cookbook. I will be offering up finance tips too!